Summer is unfortunately coming to a close. The weather will begin to cool and pumpkin and spice will be the flavors of the season. Before we completely switch gears, let’s take a moment to enjoy some of fruits of summer. Berry and fruit picking is very popular activity as many varieties are available for harvesting in August and some into September. Even though many of us are thinking of the changing of the seasons, returning to school, and packing up our summer things – we can still enjoy the tastes of summer now and year-round with desserts such as fruit cheesecakes that are perfect for all occasions! Fresh strawberries can be picked from mid-August to late September. While it is easy to associate strawberries with the summer, the berries are actually in their prime at the end of the summer. New York Style Cheesecake often comes with a thick, red strawberry topping. Strawberries are naturally sweet and are often served as a dessert with some form of dairy such as whipped cream or ice cream. It’s no wonder strawberries mesh so well with cheesecake as the sweetness from the strawberries complements cool and creamy cheesecake filling. Blueberry season is at its peak in July and August. Blueberries are often added to sweets and breakfast items such as blueberry scones, waffles, pancakes, and muffins. However, blueberries are a great addition to any dessert. Blueberries can be reduced like strawberries to create a unique blueberry topped cheesecake, showcasing the deep blue and purple colors of the blueberry. Blueberries often pair well with other fruits including lemon, orange, and even pineapple. A Lemon Blueberry Swirl cheesecake is a great throwback to summer that can be enjoyed year-round. Raspberries have two specific harvest periods (outside of California where they are available year-round) in the beginning of summer and from September to October. Raspberries are naturally tart but sweet which makes them the perfect addition to a dessert, including cheesecake. 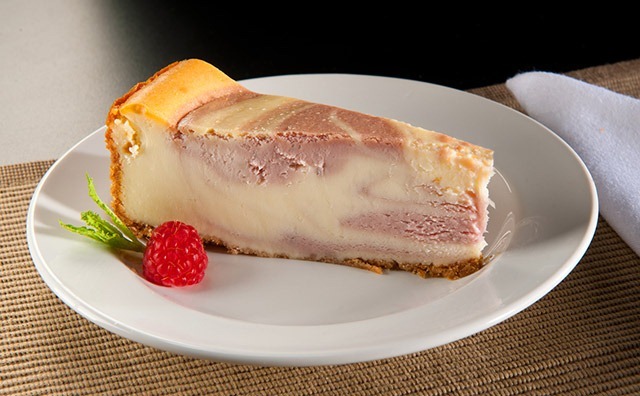 Raspberry Swirl Cheesecake highlights both the sweet and tangy flavor of the raspberry that is enveloped by sweet and creamy cheesecake. Next Next post: What Cheese Goes In Your Favorite Cheesecake?